You’ll find laid-back island style casual fun and good old Southern cooking at Gnat’s Landing. Using southern favorites as the base and offering their own island twist is what Ryan Pope is serving up at Gnat’s. Menu: Gnat’s Landing has an extensive menu, with sandwiches, burgers, seafood and salads. Gnat’s is open for lunch and dinner beginning at 11:30 a.m. and closing at last call. When people think of Georgia, they think of [easyazon_link identifier=”B0084IIQYC” locale=”US” tag=”theyum-20″]Vidalia onions[/easyazon_link]. 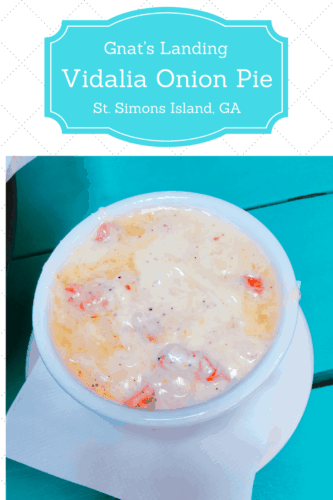 But what about Vidalia Onion Pie? This dish is served not in a pie dish, but a small soup bowl. It is more like a dip, but definitely not like any dip I have ever tasted! With each bite, all I could muster to say was “heavenly.” It is a thick, creamy, oniony goodness that can only be described as “one of the best things I have ever eaten,” as one journalist at our table said. Now, I am not a fried pickle kind of gal. Typically they are cut too thick and have too much breading. Not so at Gnat’s! The fried dill pickles were cut thin as potato chips, with just enough breading to offer a bit of crunch. These were not just fried pickles – they were out of this world little bites of delicious dill pickles that took this gal back to her childhood when my grandmother would serve thin slices of dill pickle on the side with lunch. When you are in the low country, Shrimp and Grits is pretty standard on the menu. Gnat’s has taken a low-country staple and transformed it. The grits are my favorite – this gal was raised on grits, and when you add cheese, and the grits are creamy and not grainy, with just a hint of spice, then I am hooked! Thoughts: As we sat at the picnic tables, stretched like an endless cord on the outdoor porch, the conversation ebbed and flowed like the tidal waters of the island. Looking more like it belonged on the beach shore than tucked away in Red Fern Village, with its sun-bleached wood exterior, and strings of lights decorating the ceiling of the porch, and brightly hued picnic tables, Gnat’s is a mainstay of St. Simons. Gnat’s is family-friendly, and a perfect stop for lunch after a morning on the beach. Come on in with your flip-flops (and a bit of sand between your toes) and have a sweet tea to slake your thirst and enjoy lunch or dinner at Gnat’s Landing. And for mom and dad – they offer a bit stronger libation if that is more to your liking. Gnat’s has 11 rotating beers on tap, and an excellent selection of craft beer, along with some old favorites. There’s a full bar too, and the resident mixologist will gladly mix your favorite beverage. Price Range: Appetizers are in the $4.95 to $14 range; sandwiches range $7.95 to $10.95; salads & sides range $2.50 to $11.95 and entrees are $13.95 to $23.50, with the majority of the entrees in the $16 to $17 range. Disclosure: The author received a complimentary meal. This post contains affiliate links. Clicking through for additional information or to make a purchase may result in a small commission being paid. By doing so, you help support this site and its authors, and we thank you.